For the current show at the gallery, I have on display an outstanding piece called Pincushion Man, by Richard Shaw. 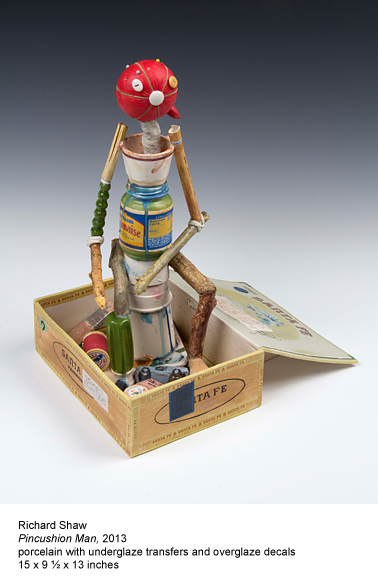 Seated on a chair of stacked paper cups, his body is composed of sticks, tools, a mayonnaise jar and a miniature coffee cup. It’s his head that gives him his name – a strawberry red pincushion with button eyes. Because this is a work by Richard Shaw, all of these elements are painstakingly rendered in porcelain, in his signature trompe l’oeil style. 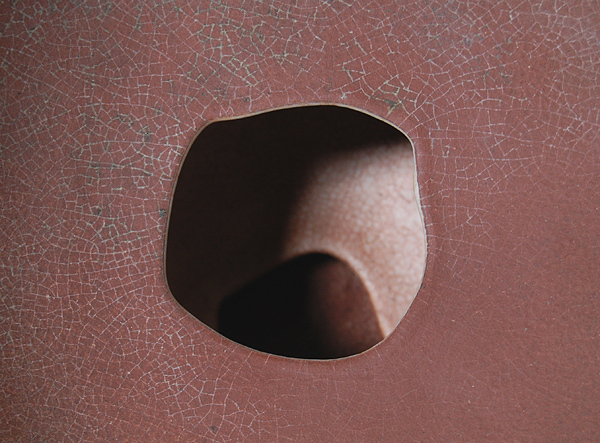 Shaw uses clay to recreate the objects of everyday life, gathering them together in still life compositions that speak to the presence of the person who ostensibly arranged them. The apparently casual nature of these pieces belie the considered relationships between items,and the layered references to pop culture, art history, and personal biography that exist within them. The figurative works take the premise of the still lifes and extend it even further. 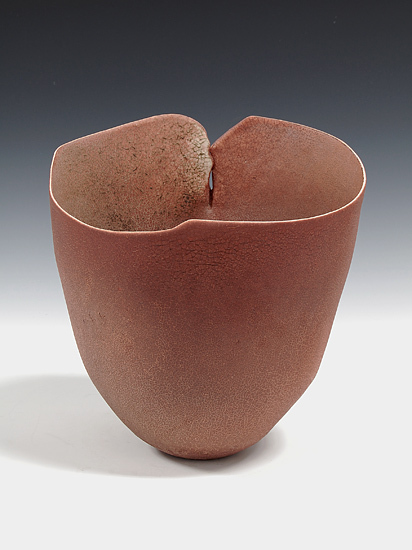 Rather than simply referencing the presence of a person, the objects become people themselves. In a 2006 interview with Richard Whittaker, Shaw spoke about these works, saying that “taking the still life and making it into a person is like breathing life into it.” The artist taps into the expressive potential of ordinary items by anthropomorphizing them. The figures communicate with viewers through gesture and body language. As the personification of a still life, Pincushion Man returns the viewer’s gaze, peering back at them with his button eyes. In 2005, Shaw was filmed in his studio by KQED for the arts education program Spark. This video really demonstrates the complexity of his artwork, revealing the enormous library of molds, glazes, decals, and transfers that he uses to achieve a stunning level of realism. The profile also captures Shaw in his element as Professor of Art at the University of California, Berkeley, where he taught until his retirement in 2012.